So.. during the last few months I’ve slowly been building up the engine bay. After much measuring and checking of radiator dimensions I’ve plumped for a dinky unit from a Suzuki Swift. 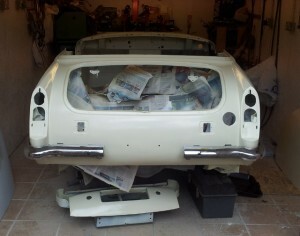 It is mounted on a custom frame and is angled backwards to ensure that it clears the bonnet. It isn’t the thickest radiator so I’m going to ensure that an oil cooler is hooked up using the original take off points that are on the 4AGE engine when mounted in a MR2. 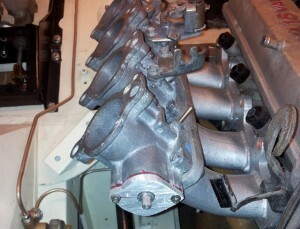 Next up was the inlet manifold,and this was bolted to the head. I acquired a set of 4AGE 20V throttle bodies and set about separating them from their inlet manifold and loosely bolted them to the manifold. As I didn’t have a connector for the Toyota throttle pot I took the harder route and knocked up a fixing plate and a threaded adapter to fit the D shaped throttle pot from a Ford/Rover. I was about to start making the engine loom and discovered that the injectors had an unusual connector. I soon gave up looking for suitable connectors and instead dug out a fuel rail that had some Denso injectors that took mini power timer connectors. Spending a few minutes a night in the shed resulted a week later in a loom for the engine bay. The ECU is an old DTA E48 chose mainly because it was cheap. Having assembled this much it was time to pull everything out of the engine bay and get ready for a bit of painting. A lot of the junk from the shed was relocated into the garden shed and painting begun. A 2K etch primer was applied to the bare metal and this was followed a few days later with a high build primer then a few coats of an Old English white sort of colour. This is the colour that looks like Tesco Value Custard under fluorescent lighting but thankfully looks better in daylight. So this is where I was at come the end of June. At this point I then suffered a bad back and then had a weeks holiday in Cornwall so progress stopped.